It was May 19, 2009. A press release revealed that Disney had bought a resort site near Washington, DC. Then came two and a half years of silence. Now there’s news again. There was precedent for a combination Disney deluxe and Disney Vacation Club (DVC) resort away from the parks. Two years earlier, Disney had announced the purchase of a 21-acre site in the Ko Olina Resort on Hawai‘i’s island of O‘ahu. By 2009, that resort was under construction. (It’s now open under the name Aulani, a Disney Resort & Spa.) Something similar seemed likely at National Harbor. Just as the Ko Olina site was away from Waikiki, the National Harbor site was away from the National Mall. But, in both cases, the sites were within developments that are destinations in their own right and that provide access to many worthwhile family attractions. When months and then years passed with no details about Disney’s plans for National Harbor, there was reasonable speculation that Disney was waiting to see how Aulani would do. At Walt Disney World, DVC was one of the big success stories of the often troubled timeshare industry and Disney’s deluxe resorts commanded higher room rates than most comparable lodging elsewhere in the United States. But would the Disney brand still be as “magical” away from the Disney parks? If Disney’s decision not to move forward with their National Harbor site is an indication of how Aulani is doing, then Aulani is not living up to the expectations that former Walt Disney Parks and Resorts chairman Jay Rasulo and former DVC president Jim Lewis had for their expensive project in the 50th state. Thomas Staggs is now chairman of Walt Disney Parks and Resorts and Claire Bilby is now the head of Disney Vacation Club. Rasulo is still with Disney in Staggs’ former position as Disney Senior Executive VP and CFO, but Lewis and two other DVC executives were fired from Disney over irregularities in the Aulani resort operations budget and dues. It may very well be that Staggs and Bilby don’t have the same enthusiasm for Disney-branded resorts away from Disney parks as their predecessors. The continuing problems with the U.S. economy (and other nations economies) must also be considered a factor. Could a Disney resort at National Harbor have been profitable? Maybe. But could investing the same amount of capital at Walt Disney World and the Disneyland Resort be more profitable? If the recent start of construction of what is expected to be a DVC resort at Disney’s Grand Floridian Resort & Spa and the thorough refurbishment of the Disneyland Hotel are any indication, the executives in charge see the answer as yes. This website is Yesterland, so I now want to take you back to May 2009. 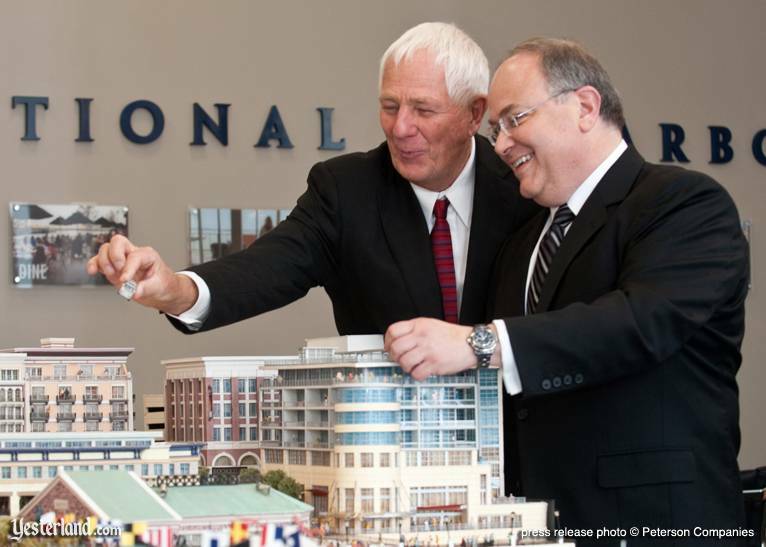 The rest of this article is my original look at the National Harbor announcement. As you read it, think about the Disney resort that might have been. In a surprise announcement this week, we learned that Disney bought a hotel site at a place called National Harbor. Lets look at where it is, why Disney chose this site, and what they might build there. NATIONAL HARBOR, Md., May 19 /PRNewswire-USNewswire/ -- The Peterson Companies announced today the sale of land at its National Harbor development near Washington, DC to Walt Disney Parks and Resorts. Disney is considering using the 15-acre site overlooking the Potomac River in National Harbor, MD as the location for a resort hotel for families and others visiting the National Capital Region. The new resort hotel would be one of Disney’s stand-alone resort hotels separate from the Disney theme parks. This new resort hotel, like the project under construction in Hawai‘i, will be in a prime geographic location and will provide guests with the same comfort, fun and amenities for which Disney is famous. Disney purchased the Maryland property from the Peterson Companies for $11 million. National Harbor is along the Potomac River, just outside of the District of Columbia. 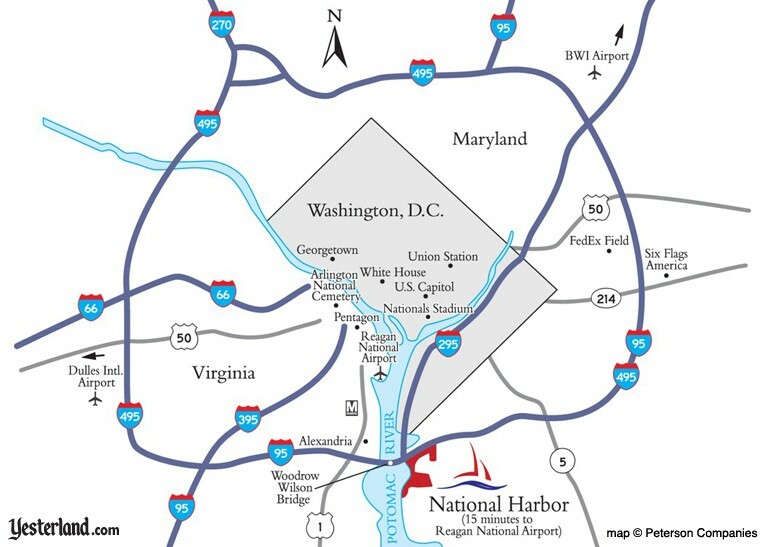 Disneys National Harbor site isnt in Washington, D.C. Its about 8 miles south of the White House in Prince Georges County, Maryland. The driving distance to the National Mall, where most of Washingtons visitor attractions are located, is around 11 miles. If the Disney site were just an ordinary suburban parcel, perhaps wedged between a Home Depot and Toyota dealer, we could complain that Disney picked a bad location. 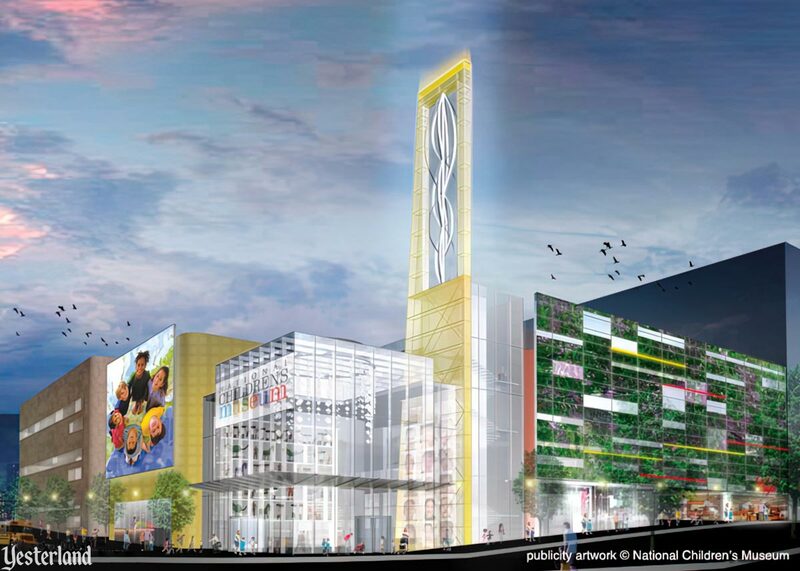 However, National Harbor is developing into an attraction in its own right. And National Harbor is a good base for visiting other Washington area sites, such as Old Town Alexandria and George Washingtons Mount Vernon. 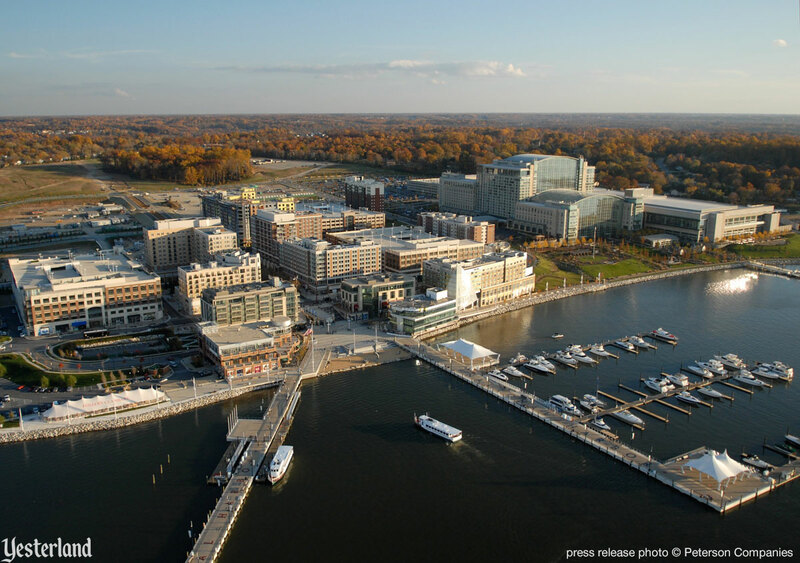 National Harbor is a former gravel pit on Smoot Bay, a cove of the Potomac River. In the 1980s and 1990s, several developers tried to develop the property. Ambitious plans for Bay of the Americas and then for PortAmerica never got off the ground. In 1997, successful Washington-area developer Milton Peterson took over the site. Peterson envisioned National Harbor, a family-friendly resort, with water taxi service to Washingtons attractions. Peterson intended to succeed where the others had failed—even if it took an act of Congress. In 1999, Congress exempted Petersons project from Federal review and protected it from the threat of possible lawsuits over environmental issues. The Disney site is behind the developed parts of National Harbor, near the isolated patch of forest. National Harbor is now a reality. By the end of 2009, there will be a couple of dozen restaurants and a half dozen hotels (including a Wyndham timeshare resort). The piers on the riverfront provide seasonal water taxi service, sightseeing cruises, dinner cruises, fishing tours, and private charters. Permanent residents live in several condominium buildings. And theres a calendar of special events, including an annual Food & Wine Festival, an Oktoberfest, a Yacht Show, and the Sunset Concert Series. In 2008, National Harbor even hosted Kooza, a traveling Cirque du Soleil show. The 15-acre Disney site is set back around a half mile from the riverfront. If theres a problem with the location of the Disney site, its with the location within National Harbor. The waterfront parcels in the main part of National Harbor have already been developed. It appears that Disney obtained the best remaining large parcel. 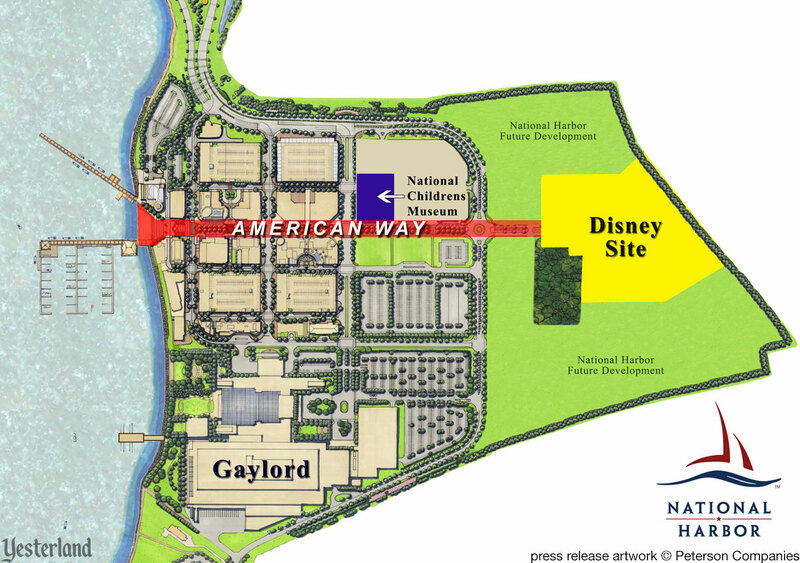 The Disney site is at the head of American Way, which is the “Main Street” of National Harbor. The Gaylord National Hotel is the major anchor of the development. As one of the early companies to join National Harbor, Gaylord Entertainment has a prime 40-acre site right on the river. 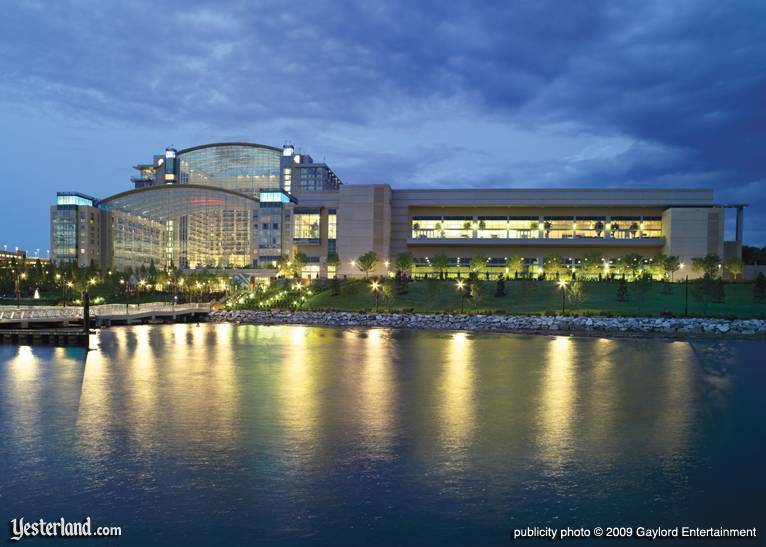 The 2,000-room Gaylord National Hotel & Convention Center opened April 1, 2008. With 470,000 square feet of convention space, the Gaylord is first and foremost a convention hotel. However, its also an attraction. A glass roof covers a spectacular 18-story atrium with colonial streets, gardens, and waterways. If youve ever been in the Gaylord Palms Hotel & Convention Center near Walt Disney World, you know how Gaylord builds hotels. The new National Childrens Museum will be in walking distance of the Disney site. The National Childrens Museum was designated by Congress in 2003. Designed by renowned architect Cesar Pelli, the 150,000 square-foot museum is scheduled to open in 2013. Considering that Disneys core customers are families with children, having this museum a short walk from the Disney site is a good combination. 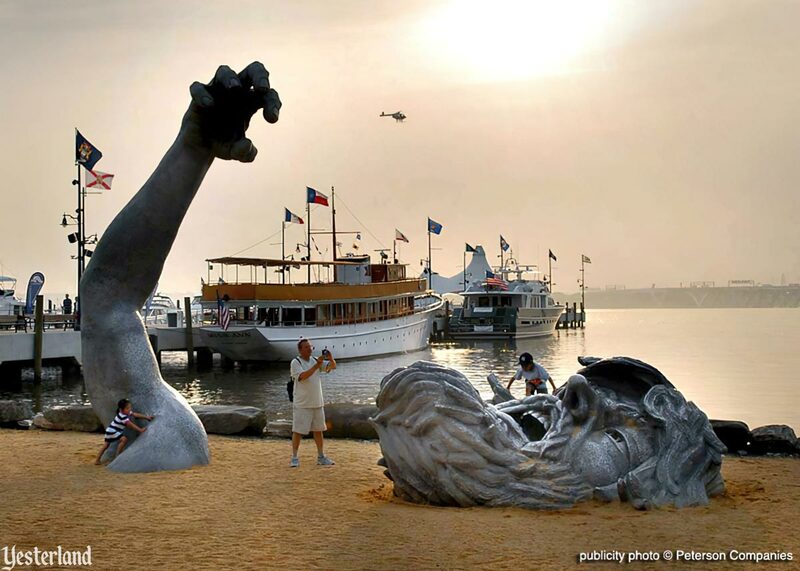 The Awakening (1980), by sculptor Seward Johnson, is now on the National Harbor waterfront. Theres a giant buried on the National Harbor riverfront, struggling to get free! Well, its not a real giant; its a five-piece aluminum sculpture. 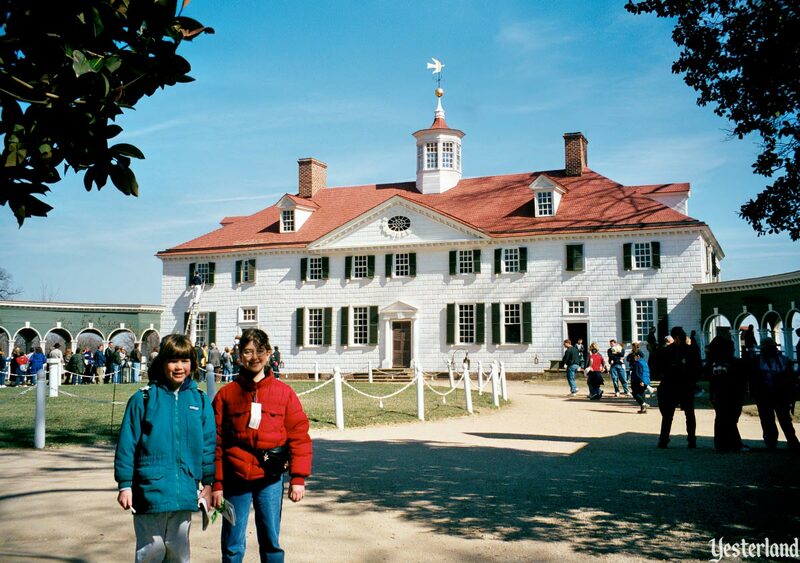 George Washingtons Mount Vernon Estate is one of many attractions in easy driving distance. Okay, by now weve established that National Harbor is a promising location. National Harbor is still working to establish itself. For example, there are not yet any movie theaters, and many of the restaurants so far are in the hotels. Theres already a lot there, and Disney will give it another boost. But that raises a big question... what is Disney going to build on their 15 acres? The Disney project in Hawai‘i will have 350 hotel rooms and 480 Disney Vacation Club (DVC) villas on a 21-acre site. The National Harbor press release says nothing about DVC, but that doesnt mean that National Harbor wont include DVC. Keep in mind that Disney often tries to say little or nothing about DVC resorts until the time is right. Disney didnt announce Bay Lake Tower at Disneys Contemporary Resort as a DVC resort until September 2008, even though exterior construction was essentially complete. In fact, its hard to imagine Disney at National Harbor not including a DVC component. Disney has been highly successful with DVC at Walt Disney World. Despite early business missteps at Vero Beach and Hilton Head, Disney is now committed to expanding DVC to new markets. The Washington, D.C. area is a great family destination, and would be a strong addition to the portfolio of DVC resorts. Like Walt Disney World, its a place that families can return to year after year. Many Americans live within a one-day drive, so its an attractive home resort. Finally, with an undersupply of timeshares in the area and with Disneys reputation, it should be a great “trader” in the RCI timeshare exchange program. 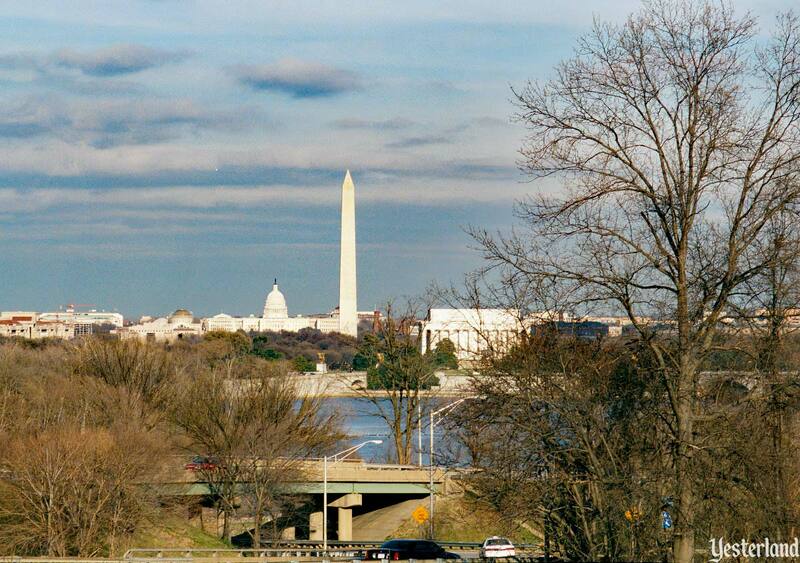 The biggest attractions in the area are the museums and monuments of Washington, D.C. Although the press release doesnt say how many rooms Disney is building, the Washington Post published that it would be a 500-room hotel. Fifteen acres isnt nearly enough land for a theme park—so dont expect the long-canceled Disneys America theme park to resurface. But its more land than a simple, 500-room, high-rise hotel requires. Consider the press release line about the “fun and amenities for which Disney is famous.” That suggests that Disney will build more than just guest rooms and suites. One possibility would be an all-weather water park for Disneys guests. Another possibility is that American Way would continue into a shopping and entertainment district on the Disney property. In any case, Disneys 15 acres is likely to be home to a true urban resort, not just a Disney-branded hotel. 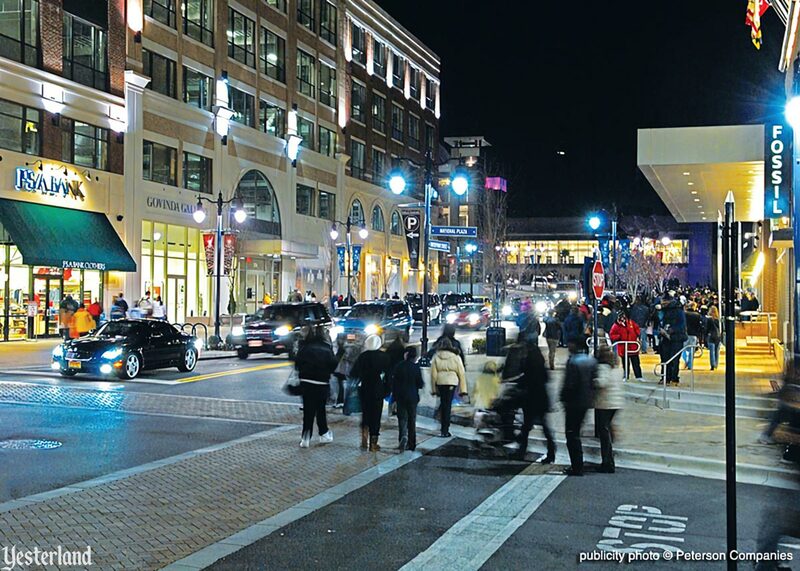 National Harbor offers shops and restaurants in a pedestrian-friendly setting. Undoubtedly, some readers of this article are thinking that with the current national economy, it makes no sense for Disney to embark on such a project. Actually, the timing might be very good. A company like Disney would prefer not to open a resort in this economy, but that doesnt mean its a bad time to invest in the future. The press release said nothing about an opening date. A project of this magnitude is likely to take until at least 2013 or 2014. For everyones sake, lets hope the economy is doing very well by then. Promotional photos and artwork from sources indicated by copyright notice on each. Photo of Mount Vernon: Werner Weiss, 2001. Photo of Washington, D.C.: Werner Weiss, 2001.